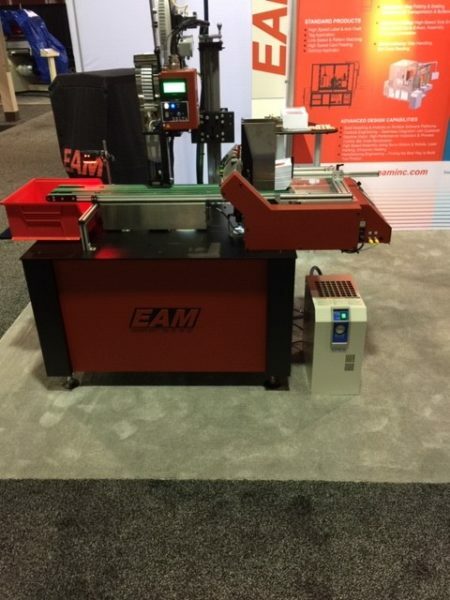 Get up to date with News about EAM, inc. the company, trade shows and conferences, and the advances in Custom Automation and Product Manufacturing. Is there still value in Trade Shows? 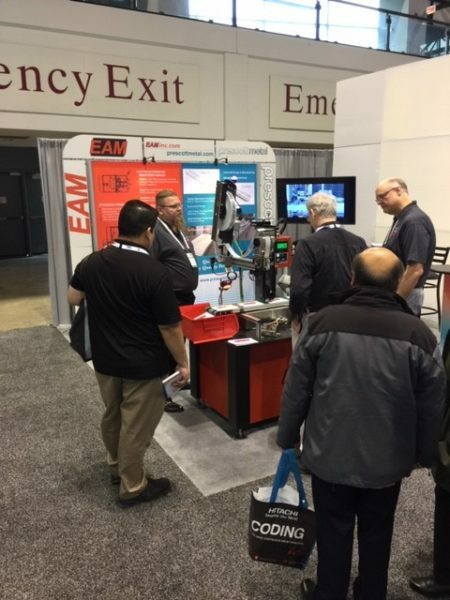 EAM has recently completed back to back trade shows in the Chicago area. Our first show was in Rosemont, Illinois at the end of September for Label Expo. We followed up that show with Pack Expo in Chicago two weeks later. Never in my 40+ years of tenure with the company have we experienced such show success. Those of you that do trade shows realize that this is a major expense for a small company like ours, but with our display from our standard product line of a running Card Feeder linked up with our Label Applicator, we really generated a huge amount of interest which will more than justify the expense! One of the largest obstacles I’ve encountered at trade shows, is getting out the message! Our company’s focus is the design, manufacture, installation and service of our Custom Automation Equipment. I believe you have just about 20 seconds to capture someone’s interest as they stroll by your booth. With our Card Feeder and Delta label applicator running drawing attention folks would stop and ask what we were doing, and the conversations would start. Expect EAM to increase the scope of our running machinery in the future! EAM is already looking forward to Pack Expo in Las Vegas, Nevada, which will take place in September of 2019. The booth is contracted, our show machine is being made even flashier, and we are ready for what will surely be another great show, not just another roll of the dice! 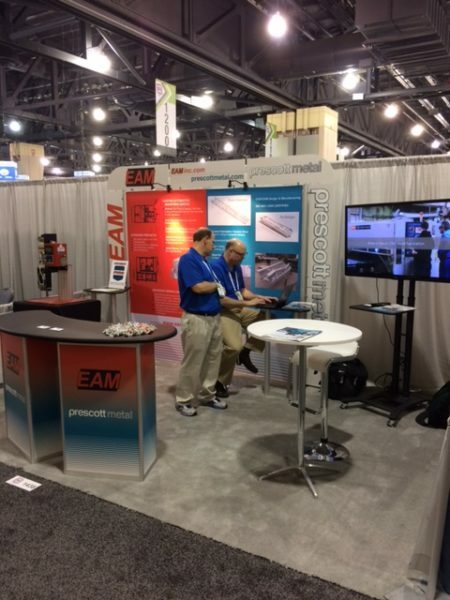 This photo was taken during a quiet period before the start of Pack Expo East in Philadelphia, PA. This show ran from February 27 thru March 1, 2017. Our Engineering Manager Bob Bartlett and our CEO John Grondin were spotted finishing up the details to a very large quote for a piece of custom automation equipment that we have been working on for a while. Engineered Automation of Maine was proud of our involvement in this trade show. We view this show as being in our “back yard”. We were able to meet key contacts in several large companies we have been targeting. Our parent company, Prescott Metal, gained some exposure as well in the metal fabrication arena. Before this show was over, we did receive word that the quote mentioned above was being awarded to us, so this work before hours was certainly not wasted! 2017 will most certainly be another year of growth, and we are now looking forward to Pack Expo Las Vegas in September. "I would like to thank the staff at EAM for helping us out and making this a very successful project." "I was highly impressed on the speed which we were able to achieve. We exceed our own expectations by 50%." Engineered Automation of Maine, Inc.